These undergrads, like yourself, are truly brilliant! Thanks for sharing your reflections on this event–too bad I missed it. With regards to your final question about how we can have transformative conversations about such issues on college campuses that don’t just rely on “academic framework:” I (obviously) think that part of how we can do this is through narrative. I also attended this event and thought Crockett and Trupupika did an incredible job of providing a much more historicized account of how the birth control movement disproportionately targeted Black women for sterilization. 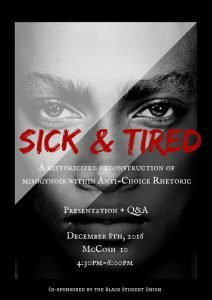 Although I recognized some of the information they presented from class, I still learned so much from the teach in and feel like I have a better understanding of how misogynoir functions in anti choice rhetoric. It was also just so refreshing to have a much more accurate account of the birth control movement being represented given the event that Princeton Pro-Life hosted a few weeks ago. It is so important to have both sides of the story told. As we have learned in our class, the fight for reproductive rights for women of color is not just about being able to have a child, but also the right to not have one. I’m so thankful that Crockett and Trupupika were willing to take time out of their busy schedules to host this much needed and timely discussion.